Polycarbonate greenhouses are available in twin wall polycarbonate, five wall polycarbonate, single tempered glass, or double tempered glass. 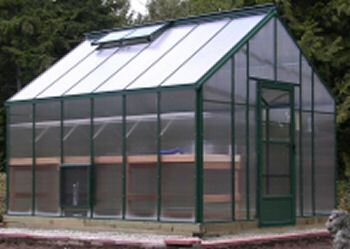 Click here to view some of our five wall polycarbonate greenhouses with a straight eave (Traditional Style). Click here for additional information on our twin wall polycarbonate greenhouses. They are structurally designed to withstand high winds and heavy snowfall. Constructed of heavy duty aluminum and unbreakable 6mm twin wall polycarbonate or our new and improved 16mm five wall polycarbonate. Twin Wall Polycarbonate Greenhouse - Next to single glass glazing, twin wall polycarbonate is the next most economical glazing material. It offers ample heat insulation and diffuses harmful sunlight in the summer. It is 200 times stronger than single glaze glass, making it very safe in a family environment. The insulation will prevent the temperature in the greenhouse from changing drastically. Five Wall Polycarbonate Greenhouse - The light transmission of five wall polycarbonate is slightly lower at 62%. The benefit is an improved R value of 3.03 which is a 21% improvement over our previous 16mm thick triple wall polycarbonate. This means that a greenhouse glazed with our five wall polycarbonate will cost 21% less to heat than the previous triple wall polycarbonate glazing. In addition, the five wall polycarbonate is about 50% more efficient than insulated double glass, 10mm triple wall polycarbonate and 8mm 4 wall polycarbonate. It is approximately 80% more efficient than 6mm or 8mm twin wall polycarbonate. Arguably, this is the most energy efficient glazing material available in today's greenhouse market. The greenhouse kit is designed to maximize growing space. The extra high 5'6" side walls are perfect for side shelving. Roof bars are designed to carry the weight of hanging baskets. Double wide individual roof vents ensure your plants will receive proper ventilation. The premium storm door has an adjustable screened sliding window that can also be locked. The door can be lowered into a foundation if additional height is required. This door drop option is offered free of charge. Standard sizing is shown on the chart below. All standard lengths are shown in grey. Find the length you are looking for, and all available standard widths are shown in green on the same line as the length. The Table 1 shows standard sizes for 6mm twin wall polycarbonate and Table 2 shows standard sizes for 16mm five wall polycarbonate. Custom sizing and paint colors also available. Standard paint colors include white, green and brown. Table 1 - 6mm Twinwall Polycarbonate - To receive your detailed quote or additional information, please email shelley@ecolad.com or call 1-800-665-2124. 6'7" 6'7" 8'7 1/2" 10'8" 12'8 1/2" 14'9" 16'9 1/2" 18'10" 20'10 1/2"
8'7 1/2" 6'7" 8'7 1/2" 10'8" 12'8 1/2" 14'9" 16'9 1/2" 18'10" 20'10 1/2"
10'8" 6'7" 8'7 1/2" 10'8" 12'8 1/2" 14'9" 16'9 1/2" 18'10" 20'10 1/2"
12'8 1/2" 6'7" 8'7 1/2" 10'8" 12'8 1/2" 14'9" 16'9 1/2" 18'10" 20'10 1/2"
14'9" 6'7" 8'7 1/2" 10'8" 12'8 1/2" 14'9" 16'9 1/2" 18'10" 20'10 1/2"
16'9 1/2" 6'7" 8'7 1/2" 10'8" 12'8 1/2" 14'9" 16'9 1/2" 18'10" 20'10 1/2"
18'10" 6'7" 8'7 1/2" 10'8" 12'8 1/2" 14'9" 16'9 1/2" 18'10" 20'10 1/2"
20'10 1/2" 6'7" 8'7 1/2" 10'8" 12'8 1/2" 14'9" 16'9 1/2" 18'10" 20'10 1/2"
22'11" 6'7" 8'7 1/2" 10'8" 12'8 1/2" 14'9" 16'9 1/2" 18'10" 20'10 1/2"
24'11 1/2" 6'7" 8'7 1/2" 10'8" 12'8 1/2" 14'9" 16'9 1/2" 18'10" 20'10 1/2"
27'0" 6'7" 8'7 1/2" 10'8" 12'8 1/2" 14'9" 16'9 1/2" 18'10" 20'10 1/2"
29'0 1/2" 6'7" 8'7 1/2" 10'8" 12'8 1/2" 14'9" 16'9 1/2" 18'10" 20'10 1/2"
31'1" 6'7" 8'7 1/2" 10'8" 12'8 1/2" 14'9" 16'9 1/2" 18'10" 20'10 1/2"
33'1 1/2" 6'7" 8'7 1/2" 10'8" 12'8 1/2" 14'9" 16'9 1/2" 18'10" 20'10 1/2"
35'2" 6'7" 8'7 1/2" 10'8" 12'8 1/2" 14'9" 16'9 1/2" 18'10" 20'10 1/2"
37'2 1/2" 6'7" 8'7 1/2" 10'8" 12'8 1/2" 14'9" 16'9 1/2" 18'10" 20'10 1/2"
39'3" 6'7" 8'7 1/2" 10'8" 12'8 1/2" 14'9" 16'9 1/2" 18'10" 20'10 1/2"
41'3 1/2" 6'7" 8'7 1/2" 10'8" 12'8 1/2" 14'9" 16'9 1/2" 18'10" 20'10 1/2"
43'4" 6'7" 8'7 1/2" 10'8" 12'8 1/2" 14'9" 16'9 1/2" 18'10" 20'10 1/2"
45'4 1/2" 6'7" 8'7 1/2" 10'8" 12'8 1/2" 14'9" 16'9 1/2" 18'10" 20'10 1/2"
47'5" 6'7" 8'7 1/2" 10'8" 12'8 1/2" 14'9" 16'9 1/2" 18'10" 20'10 1/2"
49'5 1/2" 6'7" 8'7 1/2" 10'8" 12'8 1/2" 14'9" 16'9 1/2" 18'10" 20'10 1/2"
51'6" 6'7" 8'7 1/2" 10'8" 12'8 1/2" 14'9" 16'9 1/2" 18'10" 20'10 1/2"
Table 2 - 16mm Five Wall Polycarbonate - To receive your detailed quote or additional information, please email shelley@ecolad.com or call 1-800-665-2124. 6'7" 6'7" 8'7" 10'8" 12'8" 14'9" 16'9" 18'10" 20'10"
8'7" 6'7" 8'7" 10'8" 12'8" 14'9" 16'9" 18'10" 20'10"
10'8" 6'7" 8'7" 10'8" 12'8" 14'9" 16'9" 18'10" 20'10"
12'8" 6'7" 8'7" 10'8" 12'8" 14'9" 16'9" 18'10" 20'10"
14'9" 6'7" 8'7" 10'8" 12'8" 14'9" 16'9" 18'10" 20'10"
16'9" 6'7" 8'7" 10'8" 12'8" 14'9" 16'9" 18'10" 20'10"
18'10" 6'7" 8'7" 10'8" 12'8" 14'9" 16'9" 18'10" 20'10"
20'10" 6'7" 8'7" 10'8" 12'8" 14'9" 16'9" 18'10" 20'10"
22'11" 6'7" 8'7" 10'8" 12'8" 14'9" 16'9" 18'10" 20'10"
24'11" 6'7" 8'7" 10'8" 12'8" 14'9" 16'9" 18'10" 20'10"
27' 6'7" 8'7" 10'8" 12'8" 14'9" 16'9" 18'10" 20'10"
29' 6'7" 8'7" 10'8" 12'8" 14'9" 16'9" 18'10" 20'10"
31'1" 6'7" 8'7" 10'8" 12'8" 14'9" 16'9" 18'10" 20'10"
33'1" 6'7" 8'7" 10'8" 12'8" 14'9" 16'9" 18'10" 20'10"
35'2" 6'7" 8'7" 10'8" 12'8" 14'9" 16'9" 18'10" 20'10"
37'2" 6'7" 8'7" 10'8" 12'8" 14'9" 16'9" 18'10" 20'10"
39'3" 6'7" 8'7" 10'8" 12'8" 14'9" 16'9" 18'10" 20'10"
41'3" 6'7" 8'7" 10'8" 12'8" 14'9" 16'9" 18'10" 20'10"
43'4" 6'7" 8'7" 10'8" 12'8" 14'9" 16'9" 18'10" 20'10"
45'4" 6'7" 8'7" 10'8" 12'8" 14'9" 16'9" 18'10" 20'10"
47'5" 6'7" 8'7" 10'8" 12'8" 14'9" 16'9" 18'10" 20'10"
49'5" 6'7" 8'7" 10'8" 14'9" 16'9" 18'10" 20'10"
51'6" 6'7" 8'7" 10'8" 12'8" 14'9" 16'9" 18'10" 20'10"